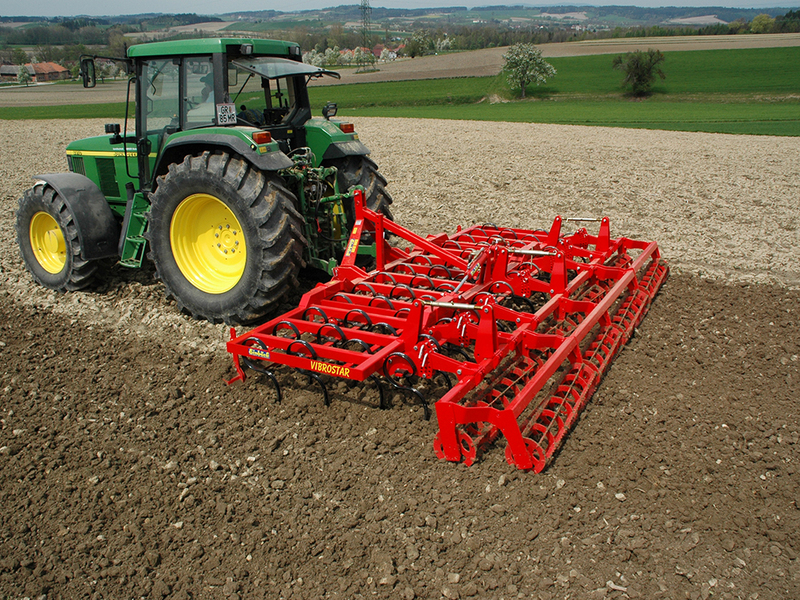 The Vibrostar is an ideal machine for seedbed preparation, wintergreen areas and secondry stubble field cultivation, working on light, medium, heavy and rocky soils. Also suitable for working in liquid and solid manure and for fighting crouch grass, depending on the tine arrangement of the Vibrostar. The vibrating spring tines mix and aerate the soil at your preferred working depth. The tines vibrate in the driving direction and also laterally whilst barely moving up or down. This way, the penetration depth will remain at your chosen setting. Features of the Vibrostar include: A compact, large diameter profile tubular frame. A large 3 point linkage and headstock. Low traction resistance due to the special tine shape. Adjustable working depth through parallel guided trailing appliances and large support wheels on non-hitched machines.